Kart racing is the best and safest way for young people to learn the disciplines of motorsport. In fact, you will find that nearly all successful racing drivers today began their careers in this exciting field. Daytona Sandown Park is uniquely able to offer the choice of our Club and Indy Circuits as dedicated Junior tracks to enable aspiring racers to learn the craft in a safe, yet challenging, environment. Age range 5 to 7 years – minimum height 107cm (3’6”) with a minimum inside leg of 48cm (19”) maximum height 130cm tall (4’3”) All children must be accompanied by a parent or other responsible adult at all times. Bambino Karting is available at all of Daytona’s Race Venues for drivers aged 5-7 years. Following on from our experience with Junior and Cadet Karting, we have launched Bambino’s to provide younger drivers with the opportunity to experience the thrill of controlling a race kart – but in a safe, closely managed environment. 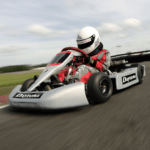 Daytona Bambino’s drive state-of-the-art CRG Karts, with Honda 35cc four stroke engines. Whilst capable of speeds of up to 25 mph, the karts are strictly governed for younger drivers. All three venues have designed and built dedicated beginner circuits for the Bambino Experience. The circuits are surrounded with Europalight barriers that provide the maximum safety for drivers. Once drivers have proved their ability and kart control, they will be considered for Arrive&Drive sessions on the venues’ main Junior Circuits. All novice drivers aged 5-7 years must first complete a Bambino Induction offer drivers the chance to complete a series of kart control and driving modules. Lasting approximately 45 minutes, our Bambino Induction includes a comprehensive safety briefing, specially developed crash helmets and race suits and supervision by experienced race marshals. Drivers will be invited to show their kart control via a series of handling modules. After successfully completing the Bambino Induction, Bambino Drivers can enjoy Arrive&Drive sessions on the venues’ more technical Junior Circuits, typically scheduled during school holidays and at weekends. Age range 8 to 15 years – minimum height 125cms (4’1”). These 25 minute timed practice sessions for juniors are typically scheduled during school holidays and at weekends. 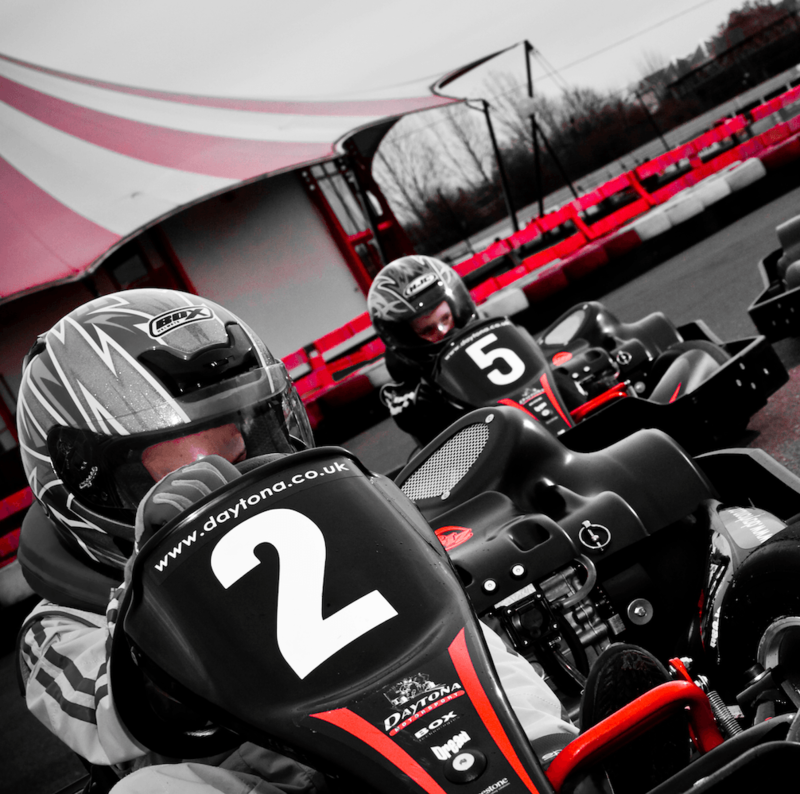 Drivers aged 8 to 11 drive on our 375m Club Circuit – wide and flowing, ideal for building confidence. Drivers aged 12 to 15 drive on our more technical 450m Indy Circuit helping to improve their race craft. Junior drivers of both age groups that have successfully completed our Junior Race School earn the privilege of driving on our full 900m GP Circuit in our advanced Junior Arrive&Drive! 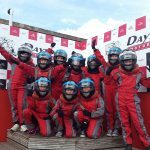 Our specially developed One Day Race School is perfect for drivers aged 8 to 15 years who want to get started in motor racing. Youngsters are taken step by step through all aspects of racing to equip them with the right techniques and an understanding of the sport. Race School includes classroom theory and lots of track tuition, plus racing. Junior Race School is conveniently scheduled during the school holidays so places are in demand making pre-booking essential. On successfully completing Race School, Junior drivers are then eligible to drive on our 900m GP Circuit in Advanced Junior Arrive&Drive and to join InKart, Daytona’s prestigious Championship. 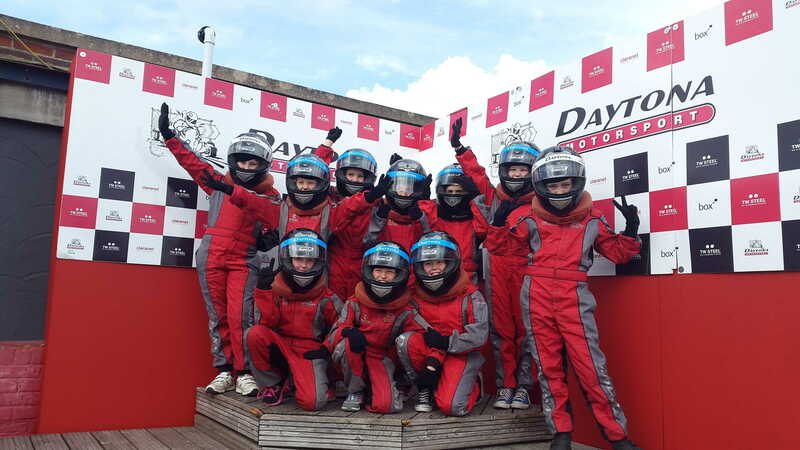 Daytona Sandown Park offers Exclusive circuit hire for Birthday Celebrations, with a minimum age of 8 years and no maximum age, parents and older siblings can join in too. Once the drivers have registered and signed in, they are issued race suits before going through to the safety briefing – a thorough explanation of track safety and flags, and kart control. Each driver is then issued their helmet and race gloves and taken to the safety of the pit lane, where they receive individual briefing on the controls. After a final safety check in which the children must demonstrate their understanding and ability to operate the karts, it’s then out onto track to enjoy their Exclusive Track session. Our Party packages are designed for groups of up to 10 drivers and there a host of superb extras available to really make it a day to remember!